Allocating a job generates a list of multiple candidate resources for allocation. Simultaneous use of machines, molds and dies and personnel, in particular, increases the number of candidates to an extreme. For example, 100 types of machines, molds-dies and personnel candidates mean that the total number of candidates is one million. At such times, a format for generating candidates in advance requires large amounts of memory and takes time to process the generation of candidates. Asprova conducts the generation of candidates sequentially, and can be cancelled before ending. That allows us to achieve a high-speed, high-memory-efficient logic. If there are restricted time relations between two or more processes such as not leaving open an interval of ten minutes or more between them, candidates must be generated simultaneously with these multiple processes. With previous formats, a second process allocation can only be decided after the first process allocation is decided, and if there is a mistake in the initial allocation, it could not be removed, and that prevents better combinations. 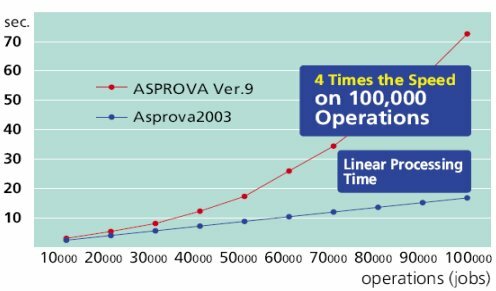 With Asprova, the candidate resources for two or more processes can be generated simultaneously, thus allowing the optimization of decisions on resource allocation for two or more jobs.